Good morning crafty friends! The end of the school year is coming up in four days, but I am proud to say that even given the chaos I still have a card to share with you today! I think I have mentioned before that I love being a teacher, but June and September are always a bit overwhelming (even after 15 years). But enough about that – let’s talk crafty! Today, over at the Tiddly Inks challenge blog, we have a new one for you – GOTHIC. Now look, I know that this theme might scare a few of you. If you have ever had a look around here at SCS, you will know that traditional “gothic” is not really something I do well. I think it’s beautiful, but I can’t seem to pull it off. But here’s the great thing about Tiddly Inks stamps – I pulled a stamp from the Gothic Characters section called “Poppy” and I think she is just as cute in a bit of a brighter palette too (I did try to mute things a little bit from my usual Doodlebug brightness). This is actually one of my favouite cards of late! So, head on over to the store and grab a gothic inspired image (or even just some gothic inspired colours to go with any image you have) and get crafty with us this week. We can’t wait to see what you come up with! 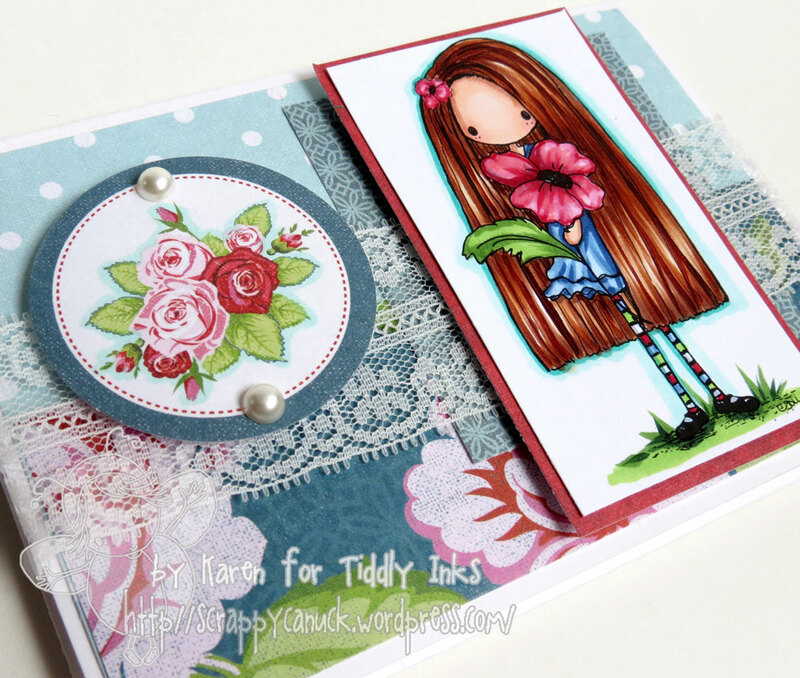 This entry was posted in Cards, Tiddly Inks and tagged gothic, poppy, tiddlyinks by Scrappy Canuck. Bookmark the permalink. So pretty! I love that bit of lace.